Senator Risa Hontiveros thanked the students of St. Scholastica’s College-Manila for rallying against the Duterte government which accused by sponsoring killing criminals. 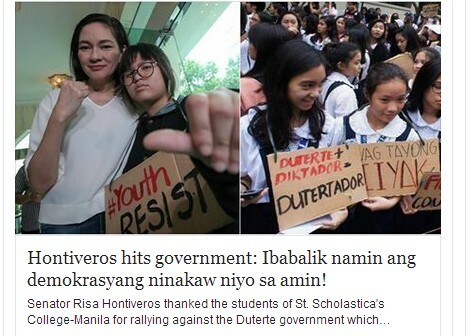 In her official statement released on Tuesday, Hontiveros expressed her gratefulness to the ‘courage’ showed by the young students of the Roman Catholic school for women to go outside their school and hold placards condemning the government. The #YouthResist rally held on July 18 was the response of the young members of the government opposition against President Rodrigo Duterte’s upcoming State of the Nation Address on Monday. She also claimed that it’s already 8,000-12,000 people have been killed by the government despite of the numbers released by the government that only 2,000 were confirmed killed during anti-drug operations. Hontiveros remarked government does not listen to the poor and full of fake news and disinformation. “That 8,000-12,000 people have been killed by the government’s bloody war on drugs, that this senseless campaign continues despite all the evidence, that murderers are rewarded with reinstatement to their government posts and even promotions; all the senseless death and tragedy is proof that our government does not listen. 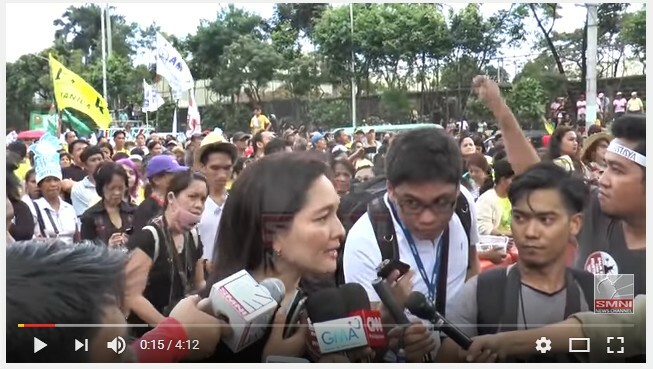 It does not listen to the poor.” Hontiveros said. “It kills the young and the poor. It does not respect the truth and democracy, it clouds them with fake news and disinformation. This is something we will not stand for.” She added. Hontiveros also told her followers on social media that they are going to take back the democracy that the government stole from them. “We will take back the democracy they are stealing from us. And we know this darkness will pass because you, the young have the light.” She said. She expressed that she’s proud that the millennials who called by the majority of the netizens as ‘spoiled, self centered and so entitled for themselves’ showed their ‘courage and patriotism’ in the streets. Hontiveros also mentioned Shibby De Guzman, a young ‘kulasa’ who lead the protest against the Marcos Burial and received online harassment because of what she did. “I am particularly proud of my fellow Kulasas, ang mga kagaya ni Shibby De Guzman, who poured to the streets to join the protest actions. This despite the online harrassment and abuse you took for speaking truth to power. For that, my young friends and fellow women, you will always have my respect and admiration.” Hontiveros said. The lady senator also recounted how she also became a young activists during the Marcos period. “I am reminded of my own youth. I was 15. And I wore the blue and white of this very school when I and my fellow students led a series of protests against the Bataan Nuclear Power Plant. That moment began a life of larger social involvement. And I am proud that you many of you have made the same choice here today.” She said. She urged the other millennials to ‘fight for democracy’ and stood up against the authoritarian rule of President Rodrigo Duterte. “To borrow a popular phrase from another world, yes, winter is here. The night gathers. But so is our resistance. THE RESISTANCE IS HERE. WE ARE THE RESISTANCE. We will fight. WE WILL FIGHT AND WE WILL WIN because in the words of your generation, you only live once, we only live once. Mabuhay ang kabataan at kababaihan!” Hontiveros said. Senator Hontiveros is one of the senators who gave the Duterte a fail grade for her first year as President.